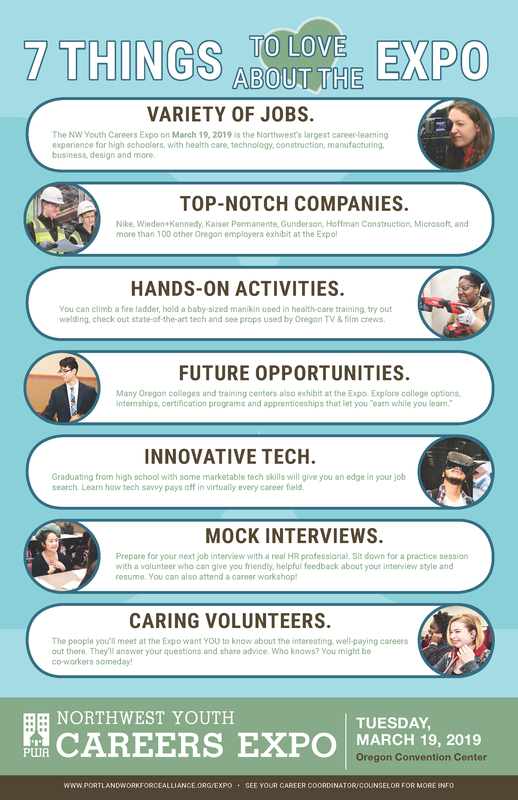 Educators: Thanks for being part of the 15th annual NW Youth Careers Expo! Here's a summary of resources and materials that will help you and your students prepare for the big day on Tuesday, March 19, 2019. Our school registration page has information about signing up for this statewide event. Students are welcome from across Oregon and SW Washington, with priority given to PWA's contract partners. 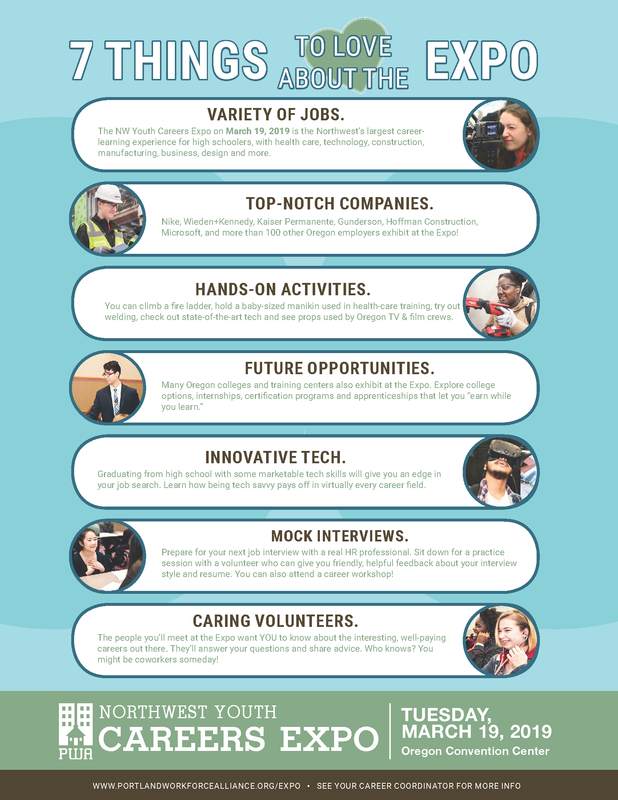 The 2019 NW Youth Careers Expo Teacher Packet gives an overview and provides sample activities for students before, during and after the Expo. We send you an “early edition” at registration. The PDF version can be filled out by students electronically. The Word version is easy for you to edit and re-arrange. Click on the link to print your choice. List of Exhibitors: See the participating employers, colleges and apprenticeship centers at the Expo. Tips for Students: Student-centered advice for making the most of the Expo experience. Mock Interviews & Career Talks: Learn more about the mock interviews at the Expo, as well as the 20-minute Career Talks on topics such as "Flash Coding with Microsoft," “How to Ace Your Job Interview," “How to Land a Summer Job" and "Uncover Hidden, High-Paying Jobs." Industry Spotlights: Browse exhibitors in high-demand areas such as technology, health care, construction & design, manufacturing, and arts & communications. Bus Handout with OCC Map: Important information about dropping off and picking up your students, including bus parking details. (Click here to see a layout of the full Oregon Convention Center. The Expo is in Halls D and C, with students entering at the southern "Prefunction D" entrance.) Buses can drop students off along MLK Boulevard or Holladay Street (north side). Be patient and make sure you have your driver's cell number. Read more information on Accessibility at OCC here. Student Expo Floor Map of the Expo floor divided into Zones. Bus Handout & Expo Map: Bus info, including bus parking, car drop-off info, and an Expo map of the Oregon Convention Center. Online Photo Gallery of the 2017 Expo. PowerPoint: Another tool for classroom preparation. Expo Poster: An 11x17 poster: "7 Things to Love About the Expo"
Expo Handout: An 8x11 handout: "7 Things to Love About the Expo"
Video with interviews about PWA's work in career exploration (4 minutes). Look for this at the Expo: The official 2019 Expo Resource Guide. Look for the huge stack of complimentary printed guides right outside the Expo Hall. It includes a map of the Expo floor, a directory of exhibitors and sponsors, and information about mock interviews and career talks. Enjoy the day with your students, and thank you for supporting their career exploration.